Lilliam Carballo - Executive Secretary - BECA. The BECA.org Foundation. Empowering Youth Education in Nicaragua. "Never consider study as an obligation, but as an opportunity to penetrate the beautiful and wonderful world of knowledge." My name is Lilliam Azucena Carballo Gutiérrez; I am from San Juan de Oriente Masaya. 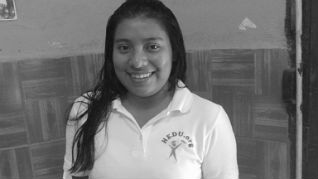 It is going to be a pleasure for me to share my amazing experience with BECA.org now HEDU.org. I knew about the foundation through my cousin Elias Carballo, at the beginning I was not sure since I wanted to apply for a career at UNAN-Managua, but I did not have the resources, I decided to investigate more about BECA.org, I visit the office and receive all information I needed which really caught my attention the way how they help young people. I apply for a scholarship on 2013. The ex-coordinators Sorania Dávila and Lester Hernández visit my house. Well I was selected; my family and I were so excited. I started with a computer course for three months on which I spent good time with my classmates, and then I worked for 3 months at the Humberto Pavón Fonseca elementary school, through this time I enjoyed helping a teacher. At the end it was really hard because I got along with all kids. After achieving 6 months I was excited of starting my technical career I wanted to take English but that was excluded. First I studied Bilingual and Computational Executive Secretariat at USTOM- Granada, we started on 2014 but we last 7 months since we were not getting the appropriate knowledge. The foundation decided to give us a new opportunity so we had to choose another place to study such as: Masinfa-Masaya, Intecna-Granada and ACC-Masaya, I took Executive Secretariat at ACC. On 2015 we start from zero, throughout the time I studied there my classmates and I learned a lot. I Offer my practices at the San Juan de Oriente town hall, at the beginning it was a little hard but I worked with them for a couple of moths actually until the end of 2015. I graduated on April 2016, I was proud of me since I was able to achieve my goal also because I was one of the best students. On 2016 I worked for four months at the San Juan de Oriente town hall, but then I gave up. When I thought I was not going to get a job, I got a call from HEDU.org because they wanted to give me a chance to work with them; I accept and met the other members. The experience was amazing because I knew who the foundation works. At the end I was selected as a coordinator. Now a day, I am so glad with God because without his help I would not be here, also thanks to my family for their support as well to the foundation for giving me the opportunity and improve every day more. I recommend everybody who is about to complete their studies work hard because opportunities in life only happen once, God will help you, sometimes it will be hard but at the end you will have your reward. Thanks BECA.org because you are helping to create a different generation… I say goodbye with this phrase: "If you can dream it, you can do it, the point is to believe in you".